The NAPDA = North American Professional Alliance was founded 2012. The NAPDA basically has two objectives. On the one hand the NAPDA wants to build up a professional dart circuit in North America, a purpose which in the opinion of many North American dart players the ADO, the national North American darts organisation neglected. On the other hand the NAPDA hopes to offer with their tournaments not as good players an opportunity to play the top players and thus to increase their level. The NAPDA spent a lot of time to come up with a reasonable and universal ranking for all North American players.At the beginning in 2013 there existed only a men's ranking but now a ladies ranking exists as well and two seperate PRO rankings for men and ladies were added. All money earned in NAPDA sanctioned or NAPDA organised steeel-tip tournaments is included in the rankings. All the rankings cover players from the USA and Canada - unlike the ADO ranking which only covers players from the USA. 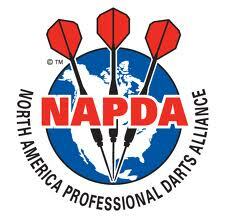 Both the NAPDA sanctioned and the NAPDA tournaments are open for all players. In the sanctioned tournaments players of the NAPDA ranking will be seeded. The sanctioned tournaments can be already existing tournaments or new tournaments organised and financed by leagues. The format can be 501 or cricket but semi-finals and finals have to be best of five. A minimum of price money has to be guaranteed when the tournament wants to be awarded with points for the ranking. The NAPDA organised tournaments will offer the players of the NAPDA ranking an opportunity to play on a professional level. One doesn't have to be a NAPDA member to play in the tournaments; each tournament will offer eight places for qualifiers. Like the PDC Pro Tour events all the tournaments will have 128 places available. The format is the same as in the Pro Tour events: 501, best of 11. The NAPDA tournaments are financed by the NAPDA and organised either by the leagues or the NAPDA and the NAPDA would like them to be part of a tournament weekend. Should a player who's not yet a NAPDA member get under the last 16 he's to become a NAPDA member should he wish to take part in other Pro events.